The best lightweight luggage weighs less without compromising the luggage quality. This is important as the bulk of the luggage weight lies in important luggage features, like the luggage frame, wheeling system and external material. Quality luggage manufacturers have developed their lightweight luggage accordingly, i.e. by concentrating on innovative lightweight design and construction. Why Go For Lightweight Luggage? The answer seems obvious. The lighter the actual piece of luggage is, the more weight you can pack. The airlines are getting increasingly strict on their luggage allowance, so every pound (kilo) off the actual luggage piece counts. Standard medium suitcase weighs over 12 pounds (5.4 kilos) but the luggage allowance for check-in bags is usually between 23 - 32 kg. While the carry-on luggage weight limit varies greatly between airlines but can be between 5 - 18 kg. How Light Is Lightweight Luggage? There is no such thing as universal standard for how much lightweight luggage should weigh. So how light is light? The consensus seems to be the lighter, the better. In our opinion, lightweight suitcases should ideally fall within the following luggage weight categories. The most common carry-on bags are 21 - 22 inches long and to qualify as lightweight should weigh less than 10 pounds (4.5 kg). The best lightweight carry-on bags weigh considerable less, or 6 - 8 pounds (2.7 - 3.6 kg). Standard medium suitcases (24-26 inches) typically weigh over 12 pounds (5.4 kg) so everything weighing less can be considered as lightweight. Most medium lightweight suitcases however weigh between 7.7 - 10.2 pounds (3.5 – 4.6 kg). The larger the suitcase, the heavier it gets, though maybe less than you might expect. Large lightweight suitcases (28 -30 inches) usually weigh between 8.5 – 13 pounds (3.9 – 5.9 kg). You can find lightweight suitcases that weigh even less than shown in the above table. You can for example find 30-inch suitcase that weighs only 7.9 pounds (3.6 kilos). You usually have to pay premium for extra lightweight luggage like that. The bulk of the luggage weight lies in the luggage frame, the material used and the extra features, like the handles and the wheeling system. This is why best lightweight luggage manufactures have concentrated on innovative design and construction when developing their lightweight luggage lines. Suitcases are either made of soft or hard external material. Soft-sided luggage tends to be substantially lighter than hard-sided luggage though you can find excellent lightweight hard-sided luggage now a days. The best soft-sided lightweight suitcases are made of durable rip-stop fabrics like nylon, or polyester. Ballistic nylon is very durable and easy to clean while polyester is popular in smaller and less-expensive bags. The best hard-sided lightweight luggage is made from polycarbonate or ABS material. Polycarbonate is both durable and flexible so that when under stress, it flexes to absorb the impact and then flexes back afterwards to its original shape. Most suitcases have some kind of inner luggage frame. The lighter the frame is the better, i.e. without compromising the frame ability to support the bag. The best lightweight luggage frames are made of light materials, like aluminum, graphite, or fiberglass and completed with the honeycomb technology (with air "pockets" for less weight as well as the ability to bounce quickly back into its original shape after enduring an impact). Extra features like wheeling system (in-line or spinner wheels) and telescoping handles add to your luggage weight, but most of us feel they are still worth it. The best lightweight luggage manufacturers try to keep the weight of those extra as much down as possible. 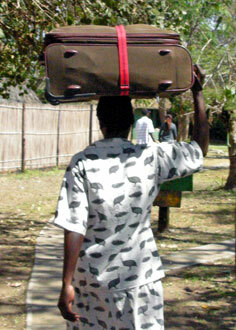 In our opinion the quality of your luggage wheels and other extras are more important than the weight.